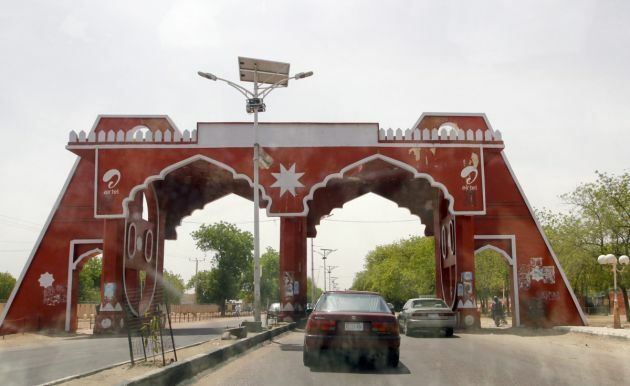 (Photo: Reuters / Afolabi Sotunde)Vehicles drive through the city gate located along Jos Road, after the military declared a 24-hour curfew over large parts of Maiduguri in Borno State May 19, 2013. Nigeria's military said on Saturday it had killed 10 insurgents and arrested 65 more as part of an offensive meant to wrest back control of parts of its remote northeast from an Islamist group seen as the main security threat to Africa's top oil producer. A spokesman for Defence Headquarters said that in the Gamburu ward of Maiduguri, where the Boko Haram uprising began, "a total of 10 suspected terrorists were confirmed dead". Picture taken through a car window. MAIDUGURI, Nigeria (Reuters) - Nuradin Mohammed used to resent and fear the troops who swept past his fish stall in this northeast Nigerian city on the trail of Islamist insurgents Boko Haram. Now, for the first time, he thinks they may be on his side. "We are pleased the president has finally recognised our peril and we pray his plan works," Mohammed said, frying fish by the roadside as a crowd of young children looked on hungrily and trucks packed with troops rumbled past. President Goodluck Jonathan took a gamble when he launched a big offensive this month on Boko Haram's four-year-old attempt to establish an Islamic state in mainly Muslim northern Nigeria. The crackdown risks stoking, rather than quashing the rebellion, but has so far met with a surprising degree of support in a region that has long accused the oil-rich Christian south of neglect. "We felt let down and ignored. We are afraid soldiers will come bullying the public, which makes people want to join the Boko Haram, but we hope this time is different," Mohammed said. Only a few months ago, Jonathan was telling foreign leaders that Boko Haram was a small problem that would be over soon. In declaring an emergency on May 14 in Borno, Yobe and Adawmawa states and ordering thousands of troops and air strikes on suspected Islamist camps, he said they were "terrorists" whose "declaration of war" could not go unanswered. Civilians like Mohammed appear to have had enough of being caught in the crossfire of a rebellion that has killed thousands in Africa's No. 1 oil producer and provoked fears of a descent into chaos in one of the continent's most dynamic economies. Even usually critical northern governors and elders have been cautiously supportive of Christian southerner Jonathan's new firm tactics, which include the offer of an amnesty to any militants who willingly surrender. "I now fully understand the strategy: show strength and be magnanimous at the same time," previously critical northern opposition politician Alhaji Bashir Tofa told Reuters. But it will take more than just firmness to win against a movement that has proved remarkably resilient under the leadership of Abubakar Shekau, a fiery militant who likes to make finger-waving Internet videos holding a Kalashnikov. Ousted from Nigeria's city centres in an earlier crackdown last year, the Islamists, whose name in the Hausa language means "Western education is sinful" withdrew to the remote semi-desert region of the northeast bordering with Chad, Cameroon and Niger. In this isolated zone, they scared off local officials and took de facto control of at least 10 out of 27 council areas. This recalled what happened in 2012 in Mali, where al Qaeda-allied Islamist rebels seized control of the Sahel country's Saharan north before taking several cities and towns. A French military offensive drove them back earlier this year. In the past two months Boko Haram mounted some of their boldest attacks to date, including one that killed 55 people. Jonathan's administration knows that just sending in more troops will never totally defeat a foe that can hide among the civilian population, even if that population has been put off by Boko Haram attacks on churches, universities and markets. "In some ways youths had more in common with Boko Haram than soldiers and wealthy politicians," said Borno public servant Ali Shuwa. Behind him, scrawny goats chew on a rubbish pile. "But I think people are tired of the fighting." As with the "surge" of extra U.S. soldiers that former President George Bush ordered into Iraq in 2007 to prevent the country disintegrating into ethnic and sectarian bloodshed, experts say Nigeria's military needs a change of tactics that will motivate the population to actively cooperate with it. "The major focus should be on securing the local population. It is popular legitimacy that will provide the intelligence necessary to fight insurgents and terrorists," said Kole Shettima, a Nigerian pro-democracy activist. Recognising this, Jonathan agreed to free some detained Boko Haram suspects this week, including all women and children, one of Boko Haram's top demands. This is a sign he is willing to take steps towards reconciliation with moderate elements. It reinforced the message that a panel he set up to try to establish a dialogue with Boko Haram is sincere. "This is the most concerted effort yet ... They've hit it with a big stick and then dangled a carrot in front of them," said Peter Sharwood-Smith, Nigeria head of security firm Drum Cussac. "They now realise the huge task in front of them." Maiduguri, the once thriving hub of an ancient Islamic trading route, has been decimated by the conflict. Soldiers hunch behind sandbag bunkers on streets strewn with rubble from bomb blasts. Traders hang carpets and piles of sandals hopefully outside corrugated-iron roofed shacks, while young boys peddle oranges and watermelons from wooden carts. But there are few buyers. Boko Haram has infiltrated so deeply here that some parents don't know their children are members. Civilians don't want to turn against insurgents because informants are often killed. "It could be him or her watching us," said Ali, a teenage boy selling jerry cans of fuel, pointing out onto the street. "People have been killed just on a rumour of informing." It was in Maiduguri in 2002 that a cleric called Mohammed Yusuf founded a radical Islamist movement initially tagged 'Nigeria's Taliban', but later nicknamed 'Boko Haram' because of its virulent opposition to Western influences. A military crackdown against an uprising by the group in 2009 killed 800 people. This included Yusuf, who died in police custody, a catalyst for years of reprisals on security forces. Jonathan says he will clamp down on military excesses after reports of human rights abuses by soldiers in the northeast, although rights groups and foreign diplomats think these may continue going unpunished given the secrecy of the operation. Rights activists say soldiers carry out extra-judicial killings and torture suspects never face trial. "We welcome that Jonathan has finally recognised publicly the abuses but these words must be turned into actions for his operation to have legitimacy," a western diplomat in Abuja said. Security sources say Jonathan's army faces a tough task in defeating resilient Islamist fighters, who have shown their ability to re-arm and counter-attack and who know the remote southern fringe of the Sahara better than most soldiers. A military source in Maiduguri told Reuters they had found the first days of the latest offensive harder than expected against "an enemy willing to hide anywhere and do anything". Boko Haram is not one cohesive group and new independent splinter-operations are emerging, making negotiations difficult. The longer this goes one, the costlier it will be, and not only in human terms. Nigeria's 2013 security budget was 950 billion naira ($6 billion), around 19 percent of total federal government spending, according to the finance ministry. Porous borders with Chad and Niger have been used to transport weapons from Libyan and Malian conflict zones and Western governments are concerned about Boko Haram's increasing ties with al Qaeda linked groups in the Sahel - a fact which could draw Nigeria's neighbours further into the conflict. "Even the U.S. government couldn't contain guerrilla fighters in Afghanistan and Iraq, so do you think we can?" Sakuria Mohammed, a Borno legislator told Reuters in Maiduguri, where his mother was kidnapped by Boko Haram this month. "The fighting is a symptom and therefore the military will not solve this. We must create jobs, rebuild this once great region and give youths a better option than Boko Haram."